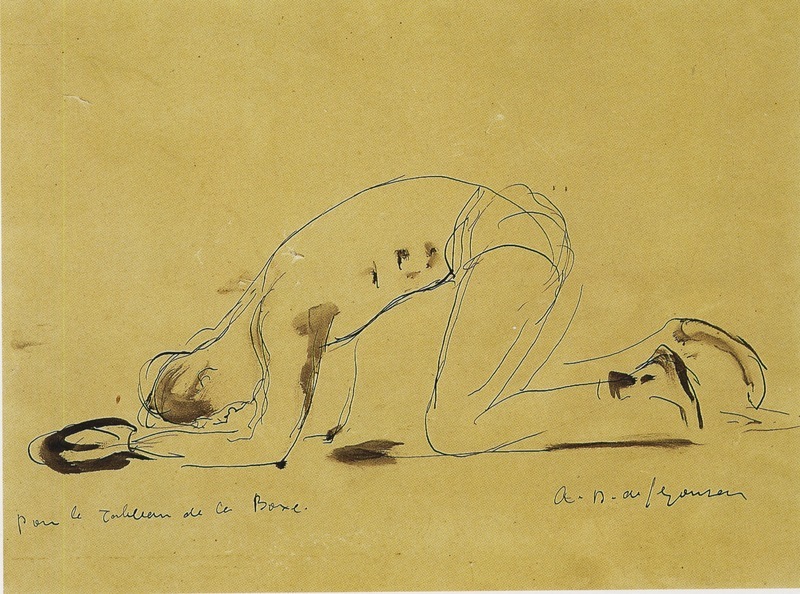 The catalog for an exhibit of French painter and graphic artist André Dunoyer de Segonzac’s (1884-1974) work held at the Musée Olympique in Lausanne in 1995 contains several pen-and-ink drawing and etchings that are clearly representations of, or at least inspired by, Carpentier. 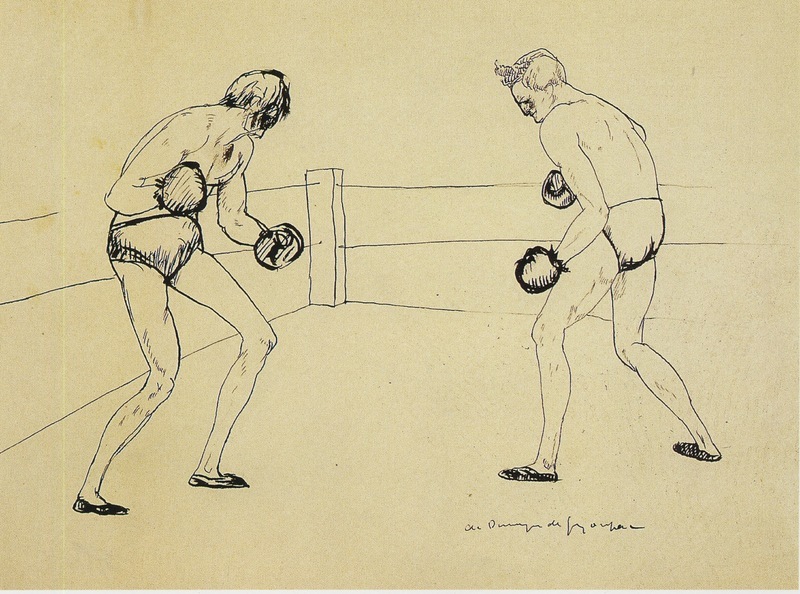 One of Dunoyer’s earliest representations of boxing, #57 in the exhibit catalog published by the Musée Olympique, is a pen-and-ink drawing from circa 1910. The catalog informs us that this was right around the time the artist began following the sport and that the boxer on the left may well be the young Carpentier. The rise of boxing in France, the rise of Carpentier and the birth of Dunoyer’s interest in the sport appear to have been virtually synchronous. 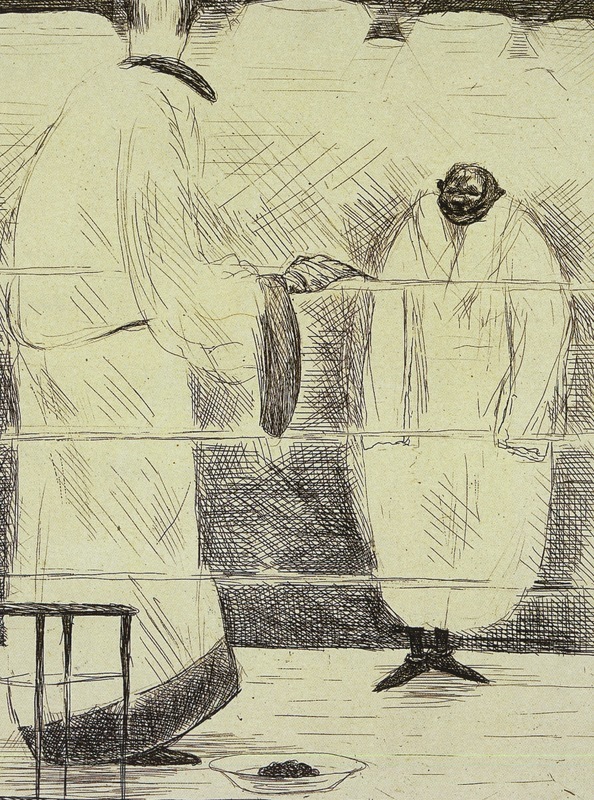 A much later etching, called “Le Knock-Out” (1930) (# 24), shows one boxer standing off to the side while the boxer he has knocked out is on his hands and knees on the canvas, buttocks in the air and forehead on the mat. The KO’d boxer’s pose is very clearly reminiscent of one of the most widely published photographs of Carpentier at the end of the Dempsey fight. Another pen-and-ink drawing (#58), created for use as an illustration for Tristan Bernard’s 1925 book on boxing Autour du ring, shows only the fallen fighter, on a larger scale. While the notes to the catalog inform us that both etchings were based on drawings done before 1914, it is nonetheless hard to believe that when Dunoyer was making them in 1925 and 1930 he was not thinking of the iconic image of the fallen Carpentier. Another illustration for Autour du ring (#79) clearly depicts Carpentier. In it, a black fighter and a white fighter face each other across the ring, both still in their robes. The white fighter, in the foreground, is wearing a floor-length, light-colored robe with a black hem, lapels and cuffs on the wide sleeves. There is no mistaking the fact that this is Carpentier’s signature grey and black silk robe, so famous to any French boxing fan of the 1920’s (especially one who was illustrating a book about boxing written by one of Carpentier’s closest friends and greatest supporters). 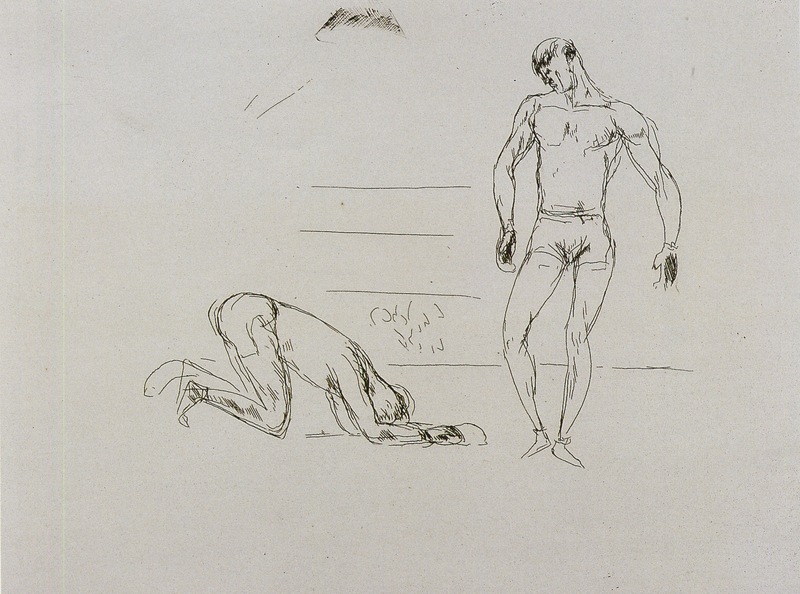 In a similar vein, the collection of the Musée de la Boxe includes a series of beautifully rendered lithographs by L. A. Moreau, produced as illustrations for a 1929 book by Edouard des Courières, La Physiologie de la boxe, which take Carpentier’s body as the model of the ideal boxer’s sculptural physique.